Changes to Douglas Council ward boundaries will "reduce confusion" for voters, the council's leader has said. Voting districts in the borough will be cut from six to four to "mirror" the House of Keys constituencies for the next local authority general election. Under the plans, the number of councillors will also be cut from 18 to 12 in April 2020. Council leader David Christian said the move was "definitely a step in the right direction". The changes were supported by councillors in 2016 but needed parliamentary approval to be enforced. Tynwald members have now unanimously supported the revisions. Mr Christian said the changes would "take away a lot of the confusion" between local authority and House of Keys elections, and help councillors "work with the two MHKs" for each constituency. Douglas North MHK David Ashford, who served on the council for almost a decade, said the reforms were "eminently sensible overall" and would "bring Douglas Council into the 21st century". However, he said he was "a bit dubious" about the impact an increase in the size of each ward could have on the number of candidates willing to stand. "It's a lot larger an area for those who have full time jobs to be able to canvass during election campaigns", he said. 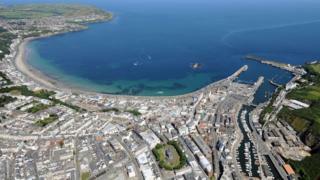 Local authority members in the Isle of Man are not paid a salary, but can claim expenses for attending meetings. David Cretney MLC, who was a Douglas MHK for 30 years before being elected to the Legislative Council, said he was "pleased" the changes were being made "at long last".